This Sunday afternoon, bohemian ‘circus punk’ rockers Bella’s Bartok will bring their vibrant kaleidoscope of sound to the Levitt AMP St. Johnsbury stage. Audiences are invited into a mesmerizing world steeped in vaudeville, playful camaraderie and the rich folk traditions of the band members’ immigrant grandparents. The six-piece powerhouse seamlessly blends Eastern European klezmer, Americana, punk and pop music, creating a lively fusion you won’t soon forget. Their passionate, eclectic sound is amplified by the group’s high-energy theatrical performances. “At their core, our shows are about a certain release,” explains the band’s lead vocalist, Asher Putnam. “We share with the audience all of our joy and grief, while they do the same back to us. 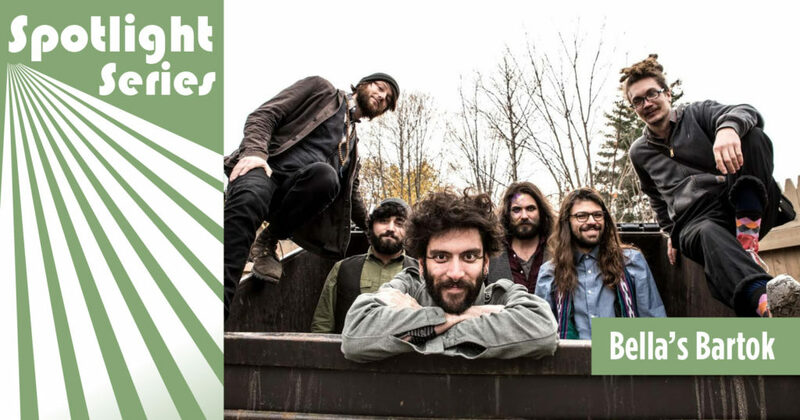 It is a wholly cathartic experience for both the band and the concert attendees.” No stranger to the Levitt AMP Music Series, Bella’s Bartok wowed Levitt AMP North Adams audiences in 2016 and they’ll also be headed to Berea, Ky., in early August to perform in the 2018 Levitt AMP Berea Music Series. In anticipation of Bella’s Bartok upcoming show atop St. Johnsbury’s bucolic, dog-friendly, 150-acre Dog Mountain, check out the video below. And if you’re fortunate enough to be in St. Johnsbury this weekend, dust off those dancing shoes because a one-of-a-kind bohemian meets klezmer meets punk dance party is headed your way!